Metro is partnering with the Music Center — if you Go Metro with a TAP card, you can save 20 percent on The Australian Ballet’s performance of Swan Lake at the Music Center in October (click on the photo above for more details). 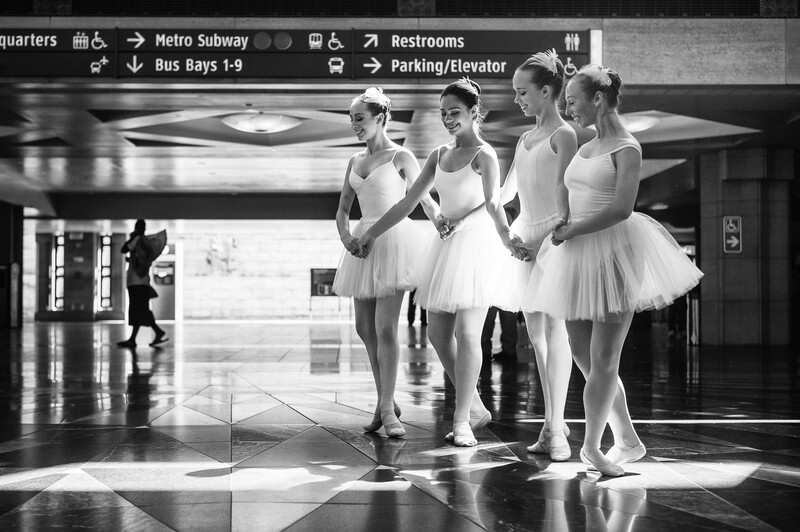 As part of the promotion, the Music Center recruited four local ballerinas — Michelle Lemburg, Bella Hoy, Jolie Moray and Katie Brady — to perform parts of Swan Lake last week at Union Station. The above photo was taken in the East Portal with a big assistance from some great light filtered through the glass ceiling. I’ll post some more pics soon. Taking advantage of those brand-new 405 carpool lanes, Metro later this year will launch an express bus through the Sepulveda Pass, offering transit riders on both sides of the hill a speedier way through one of L.A.’s gnarliest commuting challenges. On December 15, Line 788 will begin offering express nonstop service from UCLA in Westwood to the Orange Line in the San Fernando Valley. It then will continue north on Van Nuys Boulevard, stopping at major intersections on its way to Panorama City. Because it will connect to the Orange Line rapid transit busway, the line will give people in places like North Hollywood, Woodland Hills and Chatsworth a faster path to the Westside. Metro officials say the new bus could save riders up to 20 minutes from existing 761 Rapid Bus service. The article on ZevWeb has many more details. The KCRW program tackles California’s new three-foot passing law that requires motorists to give a three-foot buffer when passing bikes. Guests include Joe Linton of Streetsblog LA, an LAPD officer and Los Angeles County Bike Coalition’s Joshua Cohen. Good to see the topic and law getting attention it deserves on the airwaves — and a good listen for those riding transit who have a smartphone and can get a good cell signal. A new study by the Union of Concerned Scientists says that electric vehicles are responsible for less greenhouse gas emissions than hybrid-powered cars in 60 percent of the country — i.e. the parts of the U.S. that don’t rely on coal-burning power plants to create electricity. “An electric vehicle in New York achieves the equivalent of 112 m.p.g., according to the scientist group’s data, while in California the number is 95 m.p.g,” according to the article. 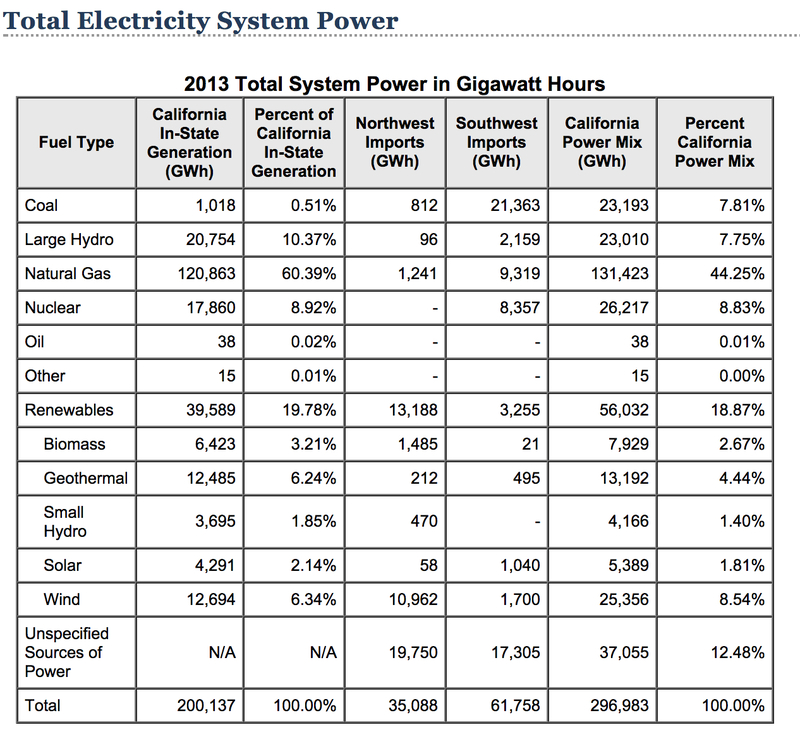 Where does power come from in California? Almost 19 percent is from renewables and another nearly eight percent from large hydroelectric (which, of course, has its own environmental issues related to changing the ecosystems of rivers). The more renewables used, the cleaner electric cars will get — and the cleaner that transit powered by electricity (including all of the Metro Rail lines) will be. As we’ve noted before, studies have found that taking transit usually results in fewer greenhouse gas emissions per rider because transit uses electricity more efficiently than most gasoline-only powered vehicles with one or two passengers in them. The restructuring of the debt used to build the road means that motorists may have to pay tolls until 2050 — eight years longer than expected — in order to pay off the debt. The 73 is intended in part as an alternative to the 405 and to serve coastal communities but usage has generally been lower than originally projected. A police shootout closed a stretch of the regular lanes on the 110 for more than 9.5 hours and motorists — many without transponders — were diverted to the ExpressLanes. They did receive fines, but those are (obviously) being refunded by Metro due to the extraordinary circumstances. The dog shouldn’t have been wandering in the street (obviously). Nonetheless, hard to overlook even more carnage from the pursuits that seem to plague this region more than most — see this New Yorker story about that (full article is behind a pay wall). I suppose you could argue that local TV stations are doing a public service showing how scary these chases are. Just like you could argue the local TV stations are just pursuing ratings while glorifying/promoting/encouraging something that comes at the expense of public health and avoiding the expense and difficulty of reporting real news. Sort of quasi-related but not really: my current transit read is “The Lost Dogs” about the fate of the pit bulls used as part of NFL player Michael Vick’s dog fighting operations. A really great piece of journalism and an interesting read — and very helpful as my partner and I rescued a pit bull earlier this year. Rant related to previous quasi-related commentary: with the NFL sort of in the news these days — and not for the Bengals pleasantly surprising 2-0 start — it’s fair to wonder out loud why Commissioner Roger Goodell decided Vick is allowed to play in the league considering some of the things he and his underlings did to dogs. I am in complete favor for this route, my only recommendations are to route the line to serve the VA Park n Ride as well as the California state university Northridge transit center, ending the line at its proposed site does not seem as convincing to riders traveling father into the valley. Then again, animals don’t really follow human made laws and regulations. As for Gordo, KNX 1070 is saying that Gordo is doing well that the vets might be able to save the leg. 1a. Will the 788 charge regular fares like the Rapid buses, or premium zone fares like Metro Express and the Silver Line? I’m guessing from the 7xx rather than 4xx/5xx numbering, it’s regular? 1b. If the plan is to charge only regular fares, has Metro considered the Title VI and general equity issues of having express buses in poorer, less Anglo corridors charge premium fares while express buses in wealthier, more Anglo corridors charge regular fares. 1c. Has Metro considered charging a premium fare on the 788 and converting the 405 HOV lanes to HOT to fund projects like the proposed Valley-Westside Tunnel and a Westwood-LAX? 3. If the 788 is extended south to the Expo Line or even South Bay, has Metro considered building elevated platforms alongside the HOV lanes so it can pick up and drop off passengers at intermediate stops without the need to navigate potentially congested ramps? 4. 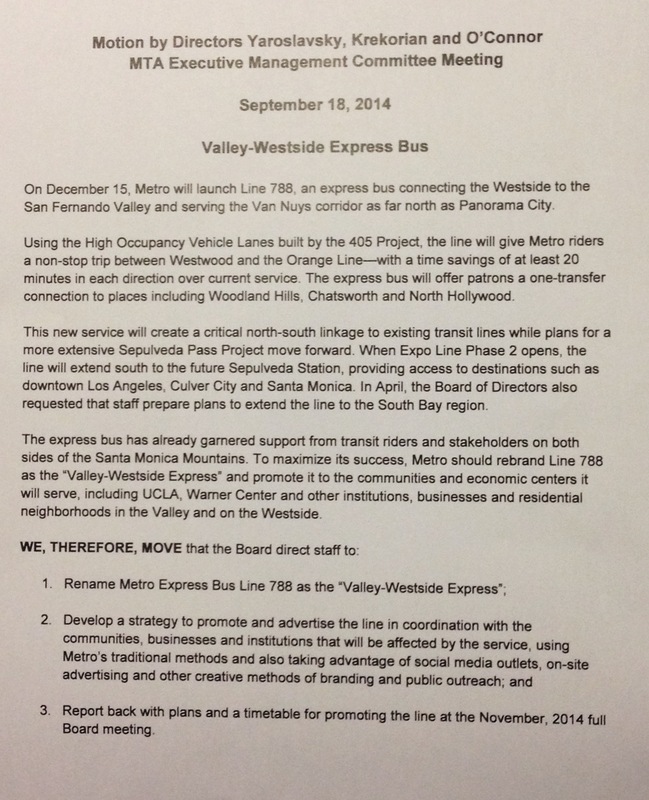 As Metro increases service to the UCLA area, it’s worth asking again – has Metro considered working with Big Blue Bus and the PUC/Legislature to turn over control of BBB routes operating largely or wholly outside Santa Monica city limits to Metro? It’s extremely inconvenient for Westwood and Pico commuters to have to deal with two different pass systems, especially because EZ Pass sales outlets are often few and far between on the Westside and even then often run out of non-senior/disabled EZ Passes. It will ruin connectivity for the new 788 if people can’t do transfers or use their passes properly because of incompatible fare systems on Metro and BBB. Or at least work out how to make fares and passes compatible between the two operators and program ticket vending machines to sell EZ Passes. I’m waiting to get more details on the new 788, including a map – which I know riders would like to see. Hopefully soon. What will happen to the 761? Will be living along Ventura Blvd. near Van Nuys Blvd. still be able to get a ride to the Westside? 761 does not take the 405 so it will likely be staying, though if 788 takes off it may see reduced service in favor of 788. Why dont they have a line running from the north hollywood station to six flags?